More Games Releases For Play2win, 21Grand & SupremePlay! Play2win, 21Grand & SupremePlay are always ready with new games in their Rival Gaming powered casino. 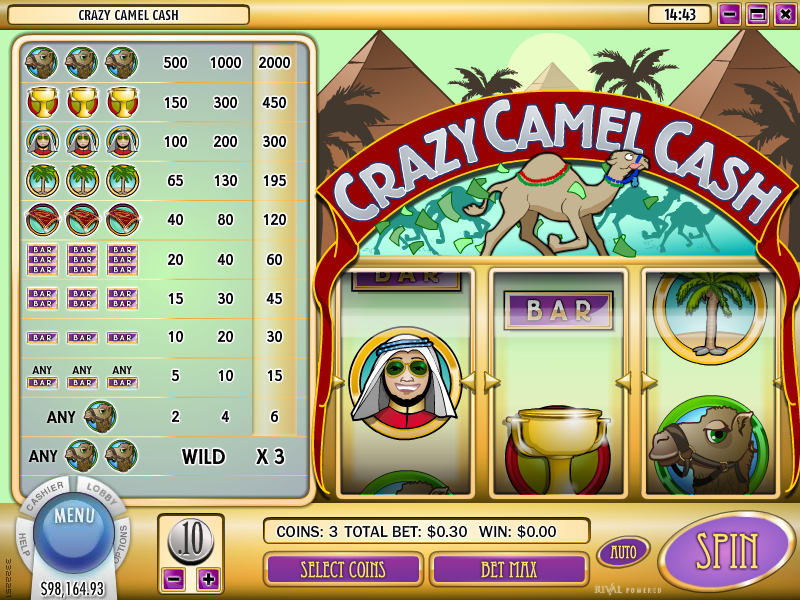 Check out the new release Crazy Camel Cash! Play2win, 21Grand and SupremePlay are proud to announce the launch of the Crazy Camel Cash video slot, which is a brand new 3 reel slot powered by Rival Gaming software. Go on a crazy camel ride through the desert! Spending too much time in the desert, might get you to see things that are CrAzY – like a magic flying carpet or a camel which pays out as a scatter, wild AND jackpot! No matter what you see, one thing is for sure; where there are camels, there is cash. Did you also know that we will see a rebranding of SupremePlay in 2013! The casino folks here are currently re-branding their 3rd casino brand, SupremePlay. SupremePlay is their latest project that will be coming soon in a complete new look and feel. Certainly we will provide you with a sneak preview soon, so stay tuned. Don't forget to join the Night Drive at SupremePlay Casino. Friends of the night receive a special promotion during night hours, each night! Just drive by and enjoy your ride. Night time is when the fun starts at SupremePlay. Each night you may request a surprise promotion, just ask their customer service on chat and they will credit you one of many promotions. All you need to do is drive by and the fun starts! Check out 21Grand Casino today! Bunnies And Bonuses For You!